REDOUTE'S CHOICE (AUS) (Bay 1996-Stud 2000). 5 wins-2 at 2, MVRC Manikato S., Gr.1. Champion Aust. Sire 3 times Sire of 1251 rnrs, 953 wnrs, 152 SW, inc. Miss Finland (STC Golden Slipper S., Gr.1), Redoute's Dancer, Stratum, Lankan Rupee, Samantha Miss, Majmu, Fashions Afield, Musir, Nadeem, Mustaaqeem, God's Own, Lotteria, Melito, Wylie Hall, Gallica, King's Rose, Snitzel, Bonaria, Anamato, Howard be Thy Name, Peeping, Royal Descent, Rafeef, etc. Super Maxi (g. by Redoute's Choice). 4 wins. See below. Salty (g. by Bel Esprit). 2 wins at 1200m to 2016-17, 3d WATC Amelia Park H.
OCEAN CHALLENGER (Rubiton). 8 wins. See above. Heeby Frenly. 2 wins at 1000m, 1400m in Aust. GREAT NORMAND (Monteverdi). 8 wins from 1m to 9f, US$553,099, Meadowlands Cup, Gr.1, Monmouth Longfellow H., Gr.3, Bet Twice S., L, 2d Monmouth Red Bank H., Gr.3, Oceanport H., Gr.3, Hialeah Ocala H., L, Monmouth Battlefield S., L, 3d Meadowlands Rutgers H., Gr.2, Cliff Hanger H., Gr.3, Hialeah Dolphin H., L, 4th Meadowlands New Jersey Turf Classic S., Gr.3. Sire. French Elle. 3 wins. See above. Ruanaidh. 5 wins from 1200m to 1600m, 2d MRC Burberry H.
Express Point. 3 wins at 1100m, 1200m, A$105,395, 2d ATC TAB Rewards H., Schweppes H., 3d ATC Bowerman Office Furniture H., Winx is Coming H.
Welcome Invader. 4 wins from 1600m to 2400m to 2016-17, TTC Tasbreeders H., JG Pest Control H., 2d TRC Schweppes H., TTC Mercure Hotel H.
Out Do Me. 3 wins from 1500m to 1600m, 3d SAJC Escape Travel H.
Excelsior Park. 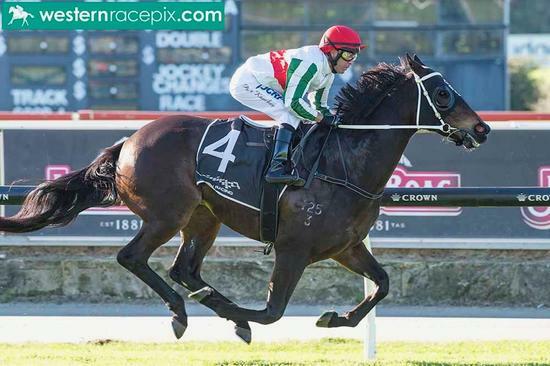 7 wins-1 at 2-to 1400m in Aust. Joanne Mary. 6 wins to 1400m in Aust. Gates Fly. 3 wins from 1300m to 1850m in Aust. Bolder Beauty. 3 wins in U.S.A.
Go Diamond. Winner at 2100m in Aust. CLUB ROYALE - MASTERMIND (H.K.) (Garde Royale). 5 wins at 1600m, HKJC Stewards' Cup, L, Repulse Bay H., Saint-Cloud Prix Phebe, 2d Hong Kong Invitation Bowl, L, Longchamp Prix de Versailles, 4th HKJC Queen Elizabeth II Cup, L. Sire. Citingo (Satingo). 4 wins-2 at 2-from 800m to 2100m, Maisons-Laffitte Prix Fast Fox, Saint-Cloud Prix du Debut, 3d Evry Prix Herod, L.
Cechov. 2 wins at 1800m, 2000m, Evry Prix des Vaux de Cernay, Maisons-Laffitte Prix de Manneville, 4th Longchamp Prix des Epinettes, L.
Corsaire Normand. Winner at 2100m, Saint-Cloud Prix de Taverny. Zoomcar (Zaizoom). Winner at 2, 2d Bay Meadows Cypress West Farm H., L.
Jimmy Coggins (Khartoum). 26 wins-1 at 2, 2d Laurel Hirsch Jacobs S., L.
Race Record: 14 Starts 4-3-2 A$160,775. 4 wins at 1000m, 1100m, A$160,775, in 2016-17, ATC TAB Rewards H., Ranvet's Salkavite H., Casino Prince at Vinery H., 2d ATC TAB H., Pro-Ride H., MRC Tile Importer H., 3d ATC Fireball S., L, Ranvet H.